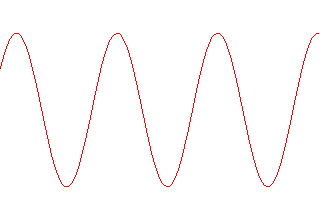 Sine wave is the Basic Input wave form for almost all amplifiers. Now we going to generate a sine wave of 1Khz Frequency and a peak to peak voltage of about 10V without using a signal generator. 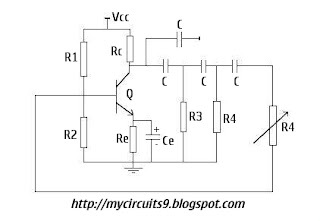 The circuit used here, is an RC Phase Shift Oscillator. 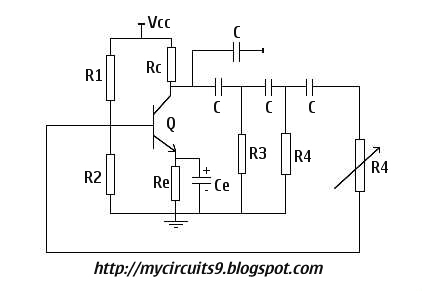 It is an RC coupled Amplifier with an phase shifting network, the phase shifted output is again feedback to the input of transistor(base). Here the Resistors R3, R4 and Capacitors C helps to maintain a Phase shift and create oscillations. Can the frequency be changed?